July Newsletter, general updates, and relative reports! Join us at our next SHHC meeting on 7/17/2018 at 1:00 PM. Join us for our June SHHC Meeting! There is a parking garage next to the building (~$3.00 for 2 hours), a dirt lot on West Columbus ($5.00/day), and metered street parking. We recommend that you save some extra time to find parking. This Housing Study was created in response to a request from the Community Preservation Committee. 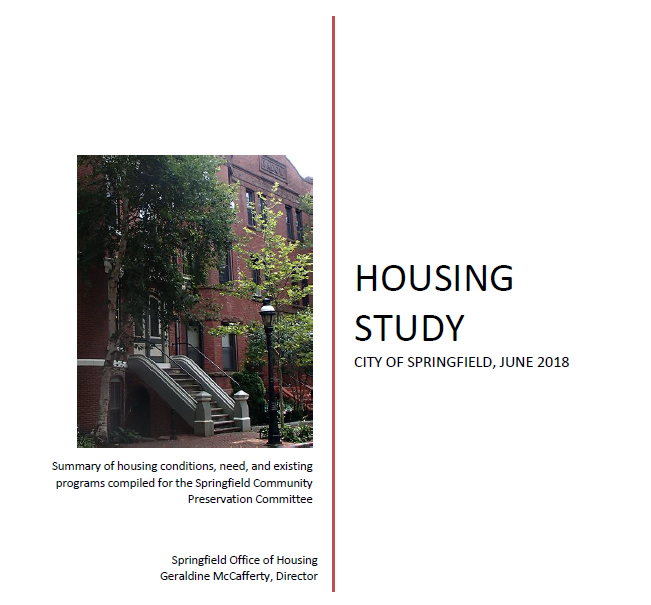 It offers a snapshot of Springfield's housing conditions and market. It draws from existing sources of information, including the most recent census data and data produced from City systems. The study describes the housing stock, housing needs and points to evidence that the market is getting stronger. Green and Healthy Homes Initiative , Baltimore, MD (Cross-Program) - GHHI has worked with jurisdictions to generate over $300 million in philanthropic, private, corporate support and public support for healthy homes services. Fort Collins Healthy Homes Program and DIY Assessment Tool, Fort Collins, CO (Policy and Education Innovation) - An innovative, community member lead solution to address indoor air quality by conducting over 800 in-home assessments using an interaction and customizable Healthy Homes Assessment Tool . Wisconsin Housing and Economic Development Authority / Thurgood Marshall Apartments, Milwaukee, WI (Public Housing) - N ew construction project provides 24 one-bedroom units of permanent supporting housing for very low-income adults who are chronically homeless and who suffer from chronic alcoholism. North Carolina State University , Raleigh, NC; and Tulane University School of Public Health and Tropical Medicine , New Orleans, LA (Research) - Major innovation in the linkage of entomologist and environmental epidemiologists, that enables a deeper understanding of how to eradicate cockroach infestations using lower toxicity approaches, significantly reducing household allergens, and improve children's health. Resources for National Healthy Homes Month! National Healthy Homes Month is now over but the information provided by the month-long campaign is important every month of the year. Please visit our website and visit the links below to learn more about what makes a healthy home. Our Collaborative continues to update the resource guide for Springfield families. If you have any input you would like to share, please forward your updates and/or edits to Kelvin Molina and thank you for sharing.